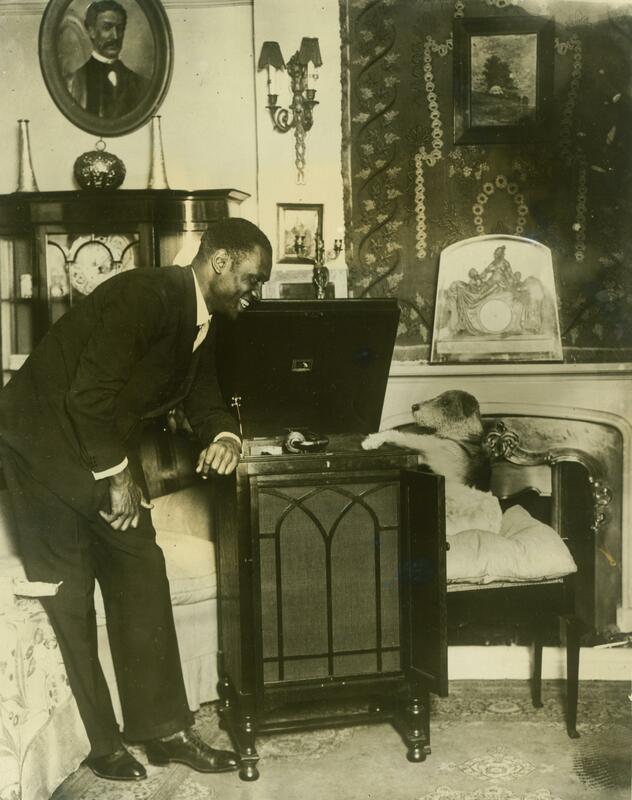 Paul Robeson sharing his latest hit with Nipper’s friend…. Robeson began his recording career in July 1925 with RCA Victor in Camden. When he moved to London after playing in Show Boat at Drury Lane in 1928 he recorded extensively for HMV (actually The Gramophone Company) up to World War II. He made only the one side for British Columbia: ‘Ol’ Man River’ on 15 May 1928 as part of a series of Show Boat original cast recordings, but was legally prohibited from it being released at the time because it broke his contractual exclusivity with Victor for the recording of the same song that he had made on 1 March 1928 in New York. He later re-recorded ‘Ol’ Man River’ for HMV with Ray Noble on 12 September 1930 when the label exclusivity had expired. The original Columbia recording was not released until many years later. This entry was posted in FILMS, great recordings and tagged hmv, Paul Robeson, ray noble, rca victor, show boat by Nipper. Bookmark the permalink. Mr Robeson’s little doggie friend looks quite a bit like Asta! Certainly a clever little dog himself; it wouldn’t surprise me in the least if the wee Asta wasn’t demonstrating the machine. I cannot begin to tell you how much I love this photograph. I’ve seen quite a few Robeson photos but I’ve NEVER seen this one – I love it on so many different levels. That’s why I want the complete history of it (as you know it to be). Would you be so kind as to crank up every little bit of information you have. Thank you so much and keep up the good work!